Vancouver Island, British Columbia's year-round golf destination, is home to two award-winning golf courses owned & operated by the GolfBC Group: Arbutus Ridge Golf Club & Olympic View Golf Club. Learn more about Arbutus Ridge and Olympic View, and book your tee times online. The GBC Golf Academy brings together teaching instructors with two of Vancouver Island's most scenic golf destinations: Olympic View and Arbutus Ridge. 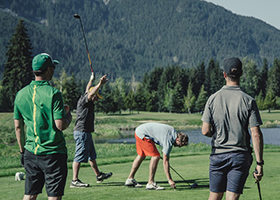 Offering personalized individual lessons, fun group clinics, entertaining corporate excursions, fitness evaluation assessments, golf and tennis packages and a world-class golf school, the GBC Golf Academy has proven to be B.C. 's most advanced teaching facility. For more information on the GBC Golf Academy: at Olympic View or at Arbutus Ridge.